From 5 November 2018, expanding the regional areas where Work and Holiday (subclass 462) visa holders can work in agricultural (plant and animal cultivation) to qualify for a second year of stay in Australia. Previously only those who worked in Northern Australia were eligible. From 5 November 2018, increasing the period in which Working Holiday (subclass 417) and Work and Holiday (subclass 462) visa holders can stay with the same agricultural (plant and animal cultivation) employer, from six (6) to 12 months. The option for a third-year for Working Holiday (subclass 417) and Work and Holiday (subclass 462) visa holders who, after 1 July 2019, undertake six (6) months of specified work in a specified regional area during their second year. Increasing the eligible age for Working Holiday (subclass 417) visa holders from Canada and Ireland to 35 (previously and for all other eligible nationalities, the age limit is 30). It is also expected that there will be an increase in the annual caps to a number of countries that participate in the Work and Holiday (subclass 462) visa program. 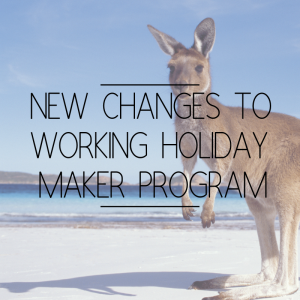 These changes are great for those visa holders who want to stay in Australia for longer than they were previously able. But even more importantly it seems that these changes were intended to benefit rural Australian areas, by contributing to those local employers and businesses. Seasons Greetings! Our Christmas and New Years Hours.